I knew drinking coffee had fantastic health benefits, but who knew it would cause you to lose weight? Sweet. In light of this revelation, my New Year's resolution this year is going to be to drink more coffee. Why? 1. It's a New Year's resolution I can actually keep. 2. 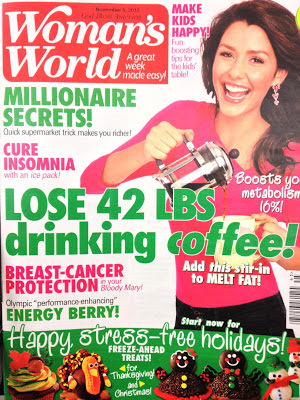 According to Woman's Word magazine, I'm gonna lose 42 lbs. Stay tuned. I'll let you know when the 42 lbs magically and instantaneously fly off my body. I'll probably be drinking Eysals Coffee, the best coffee known to mankind, when it happens. By the way, if you'd like to learn how to transform your New Year's resolutions into your New Year revolution, then this is for you!